Russia internationals Aleksandr Kokorin and Pavel Mamaev have been punished after video emerged of them reportedly partying in Monaco after being eliminated from Euro 2016. 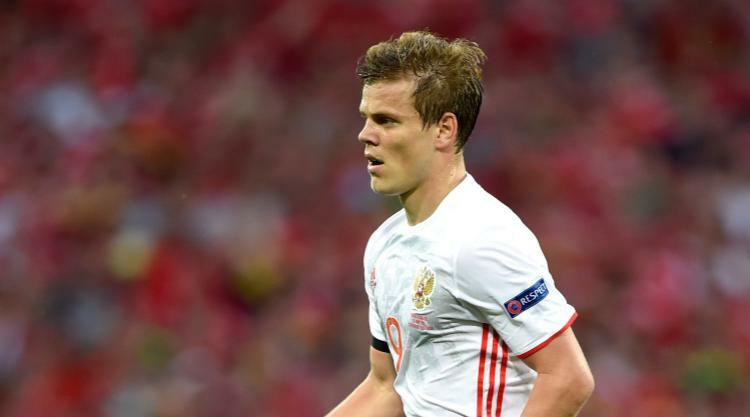 Russian media claim Zenit St Petersburg forward Kokorin and FC Krasnodar midfielder Mamaev bought 500 bottles of champagne at a cost of 250,000 euros (Â£213,000) at Twiga, a nightclub in Monte Carlo. Kokorin told Russian news agency TASS on Tuesday that he and his team-mate Mamaev had nothing to do with paying for the party. However, Zenit and FC Krasnodar have issued statements confirming the pair have been demoted from their respective sides' first teams. A statement on Zenit's official website read: "Zenit Football Club wish to state our extreme disappointment over the incident involving our player Alexander Kokorin. "Unfortunately, some Russian players can find themselves in these scandalous situations due to a lack of common sense and culture norms in their behaviour in public places. "We have conducted our own investigation into this episode and it has given the entirety of Russian football damage to its reputation. "Therefore the club have decided to move Alexander Kokorin to Zenit-2 and impose on him a substantial monetary fine." Krasnodar also released a statement calling Mamaev's behaviour "outrageous and unacceptable". Russia were eliminated from the European Championship without winning a game in Group B in France. Presidential spokesman Dmitry Peskov told TASS: "Everyone heard about this incident, including the Russian president (Vladimir Putin)." Peskov, though, offered a note of caution: "We have to be very careful and work out to start with whether our footballers paid for this beastliness or someone else."